So, I went incognito last night. I’m not giving up on Blogtober… promise. But I did drop off the face of the earth, and I wanted to explain why. I was going strong… and then I crashed. Don’t worry, I wasn’t in a depressive hole or anything. Just really tired. But it wasn’t all because of Blogtober. I’ve mentioned before (in my previous post, actually) that I want to start freelance writing. So, I’m learning about that, doing Blogtober, and working my part time day job. I’m only working the latter 26 hours a week, but I also work on the blogging while I’m there. Then I come home and work some more. I’m not complaining at all; I love being busy. And I think because I love blogging and building my social media so much, I wanted to do it 24/7. And it turned out to be a little too much every single day. Being able to write a blog is, like, the best thing in the world. You get to write about things you like and/or talk about your feelings, with the potential to turn it into a business. You have the potential to make money simply by being yourself and even making friends online. Obviously, it’ll take a lot of work, but it can be done. The only part I’ve seemed to pay attention to the last week or so was the work part. And it started to wear on me. On the real, I think I just gave too much too soon. I was pouring over freelance writing tips and how-tos, boosting my own social media presence, participating in follow loops & trains, keeping up in Instagram pods, and writing a blog post every day… while working a part time job. It’s all stuff I know I can do; my strategy just needs a little work. When should I pound out the blog posts; when should I participate in social media pods; when should I work on pitching and writing for clients (or learn how to do it); what direction is my blog going now? I was trying to stay on track but wasn’t getting anywhere with that last night. So, I gave myself permission to take a break, at least for one night. Bottom line is, no one should be going and going and going 24/7. It’s not good for you, and at some point, your brain and your body are gonna be like, “Nope”. Also, keep in mind that if you have existing health issues- physical or mental– for which you are receiving help from a doctor, you’ll need to take it easier than others might. I’m reminded of a news snippet I saw some time ago: Kayla Montgomery, the track runner with MS. She doesn’t let her Multiple Sclerosis stop her from competing, but at the end of every meet she falls into her coach’s arms; her legs have gone numb, so she can’t stop herself. He then carries her off to be iced down and hydrated. This is necessary, otherwise she can’t compete. Your obstacles shouldn’t stop you from doing what you want to do, but it’s ok to fall and take care of yourself after a home stretch. I’ll be taking it a little easier from now on. I’ve always felt if you’re not getting results, you’re not working hard enough. But I’ve seen repeatedly, through my own experiences and the experiences of others, this isn’t true. Some things require more patience, or an adjustment in approach, or even just a night off. What you do is part of who you are, but it doesn’t define you. What about you? 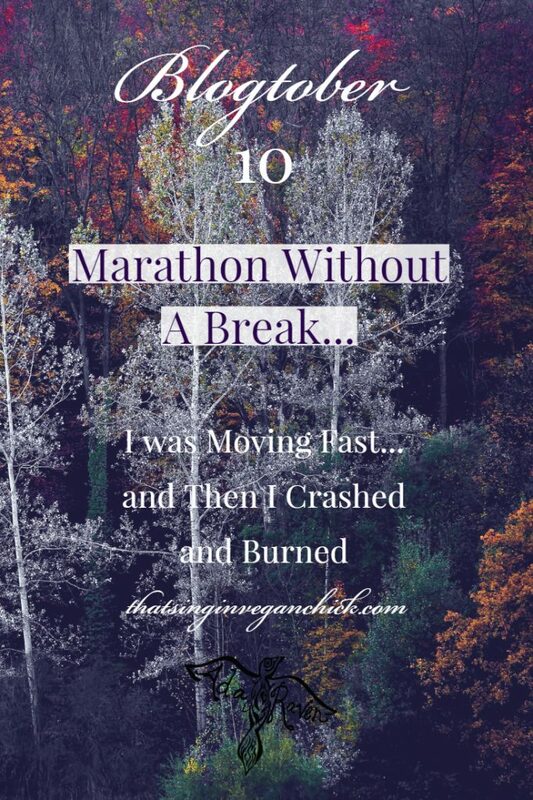 Have you been running your own marathon with no signs stopping?